Last autumn I went on a smallholding course taught by Simon Fairlie and Jyoti Fernandes at Monkton Wyld Court in Dorset. I’m not actually planning to take up smallholding at my ripe old age. But, as a permaculture teacher, many of the people I teach aim to get their little plot of land in the country one day, so it seemed a good idea to learn a bit more about smallholding from a couple of people who really know what they’re talking about. The course fulfilled my expectations and more. An important element of the course was the visits we paid to smallholdings in the area. I thought there’s no better way to start this blog off than with a series of posts about those visits. The first of them was to Flintbatch Wood. Guy Furner owns and manages the wood and his aim is to demonstrate how animals can be combined with woodland crafts to make a woodland like this productive. He makes part of his living from the wood and the rest from managing other woods and landscaping. Charcoal is a useful output as it makes use of small or crooked wood which has no value for other crafts. The trees are mainly beech, planted in the 1950’s. Many of the larger ones were of poor form for timber so he felled them and allowed the younger ones to grow on. To replace them he’s planted sweet chestnut for timber and chestnut, hazel and lime for coppice. These are planted in a mosaic of small single-species blocks. Sweet chestnut is a particularly good choice here as it suits the sandy soil. 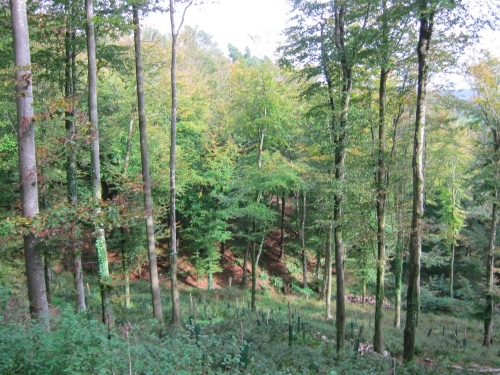 This area has been thinned and replanted, leaving beech trees with beautiful straight, branch-free stems. The animals are pigs, chickens and ducks, and he plans to introduce other kinds of poultry too. The pigs are used to prepare the ground for tree planting by rooting out the existing vegetation. The wood is divided into 6 compartments and the pigs clear one of them at a time. 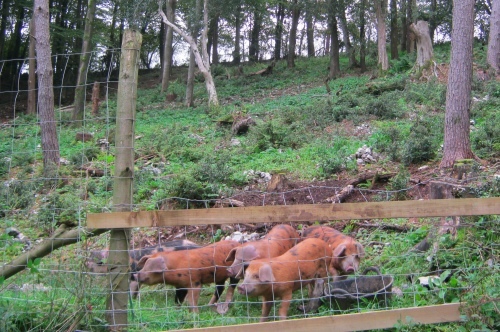 Guy finds two sows and their progeny are just right for this 16 acre (6.5ha) wood. The sandy soil suits pigs as a heavier soil would suffer from compaction, even with this light stocking rate. Some of Guy’s pigs at work. There’s a clearing in the wood where a number of springs made the soil too wet for tree growth. Guy turned this problem into an asset by making a series of ponds, which dried up the land in between them. This is naturally where he keeps the ducks. Unfortunately the surrounding trees still cast significant shade, enough for the ducks’ internal clocks to register the onset of autumn as early as August, and they stop laying then. So he’s thinking of changing from egg production to meat birds or breeding ducklings. He has also planted some fruit trees on the dry land between the ponds. 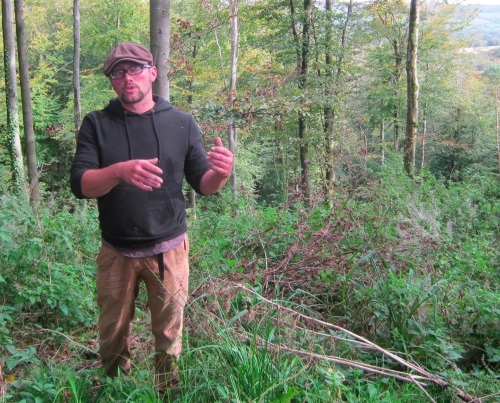 I was impressed by the huge amount of work that Guy has achieved in the few years he’s had the wood, by the diversity of produce he gets from it and by the way he’s integrated animals and woodland. 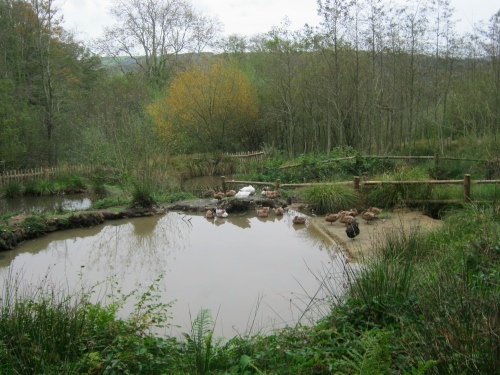 This is a good example of permaculture applied to woodland management. In fact Guy came on one of our courses many years ago, but I don’t think I should claim much credit for what he’s done at Flintbatch. 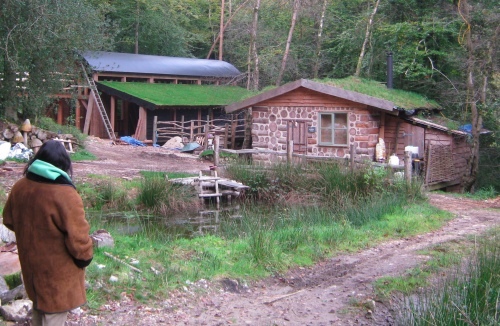 Guy has built a cordwood cabin and a barn for processing woodland produce, using all his own timber and wood. Permaculture Gardening: from seed to table. Copyright © 2014 Patrick Whitefield Associates. All rights reserved.